Can’t wait to feel the sun on your skin? To stretch out and bask in those glorious holiday rays? We’re right with you, and our men’s designer swim shorts have got you covered. Our Palm Swim Shorts are inspired by the strong, long-lasting palms of Abu Dhabi. At Decisive Beachwear, we’vetaken this feeling of strength, power, and warmth toour swim shorts in a classic design that will have you looking amazing all summer long. Whether you’re headed to the azure South Pacific, hitting the beach on Phi Phi island, or just chilling out by a hotel pool, you’ll be looking great and feeling comfortable in our Palm Swim Shorts! No matter where you’re going for your next big adventure, we believe you should do it in comfort and style. Swimming with the turtles, sailing the high seas, or diving amongst tropical coral—we’ve designed Decisive Beachwear to be everything you could possibly need. 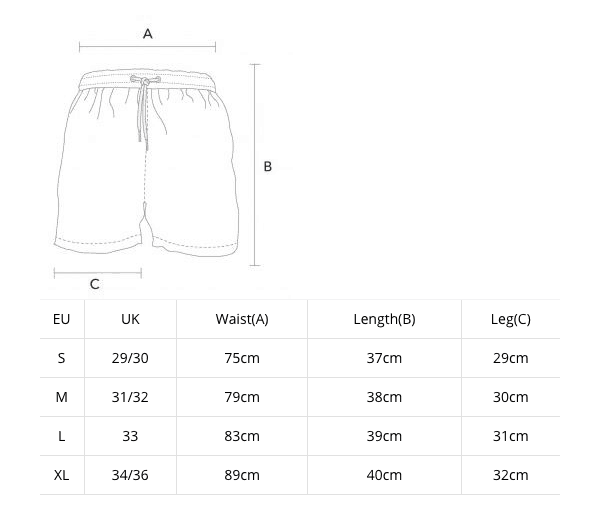 We’ve mixed contemporary fashion with unparalleled comfort when it comes to beachwearand your men’s designer swim shorts are crafted with love and care. 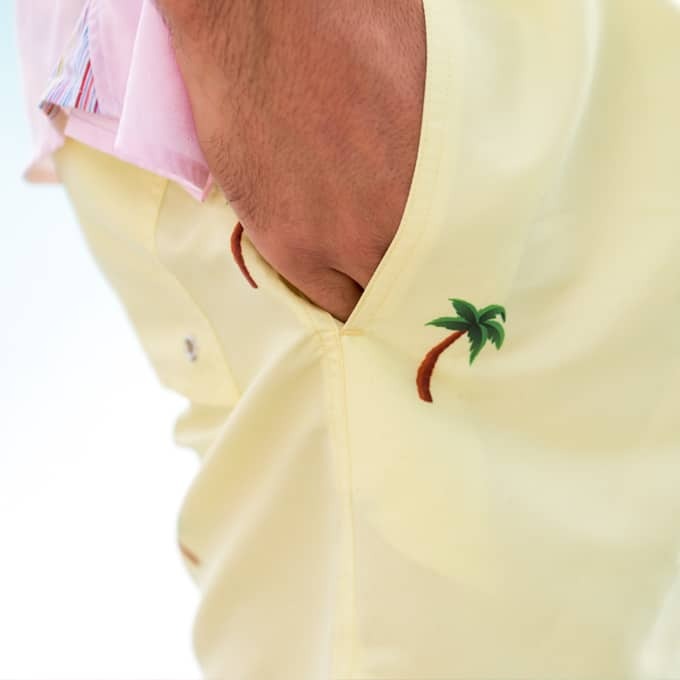 Every single detail combines seamless comfort with cutting-edge style, whichwe’ve topped off with an exotic palm design that will have you dressed to impress. These swaying palms are like a welcome breeze against a soft, gentle pastel yellow background that draws inspiration from the Abu Dhabi desert. They’re like an oasis in the middle of the summer! At Decisive Beachwear, every design we make reflects the beauty of travel. Of days spent relaxing on the beach from sunup to sundown. Of gentle breezes that rock you in your hammock and the lap of waves against the rocks. We’re here to inspire you, to invite you to the Decisive Lifestyle and everything we believe in through our unique, high-end beachwear. We take unforgettable moments and make them wearable by creating beachwear that’s perfect for any time and place. All our men’s designer swim shorts capture this vision, by being ideal for all-day-long wear. We know what it’s like to exploreand discover foreign lands, you never know what’s around the next corner–and that’s why we only ever design shorts that will be comfortable all day long. We also believe that your getaway should be hassle-free and all about you. Not about changing each time you want to head to a cafe, grab something from a beach bar, or head from the surf to a party!Your Palm Swim Shorts are crafted to be perfect for all occasions and look just as great on one of Abu Dhabi’s city clubs as they do on Nikki Beach. Decisive Beachwear uses innovative quick-dry technology for every one of our men’s swim shorts. Meaning, they’re completely flexible if you’d like to head out of the pool and take your hustle elsewhere. We’ve cut out the part where you wait around for your shorts to dry before getting on with your life! 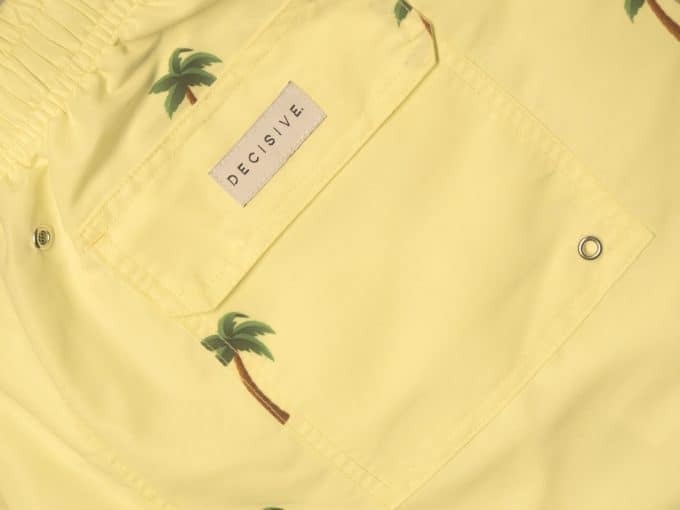 Hitting the markets, club hopping or beach hopping, and going out for a meal all become effortless when you’re wearing your yellow Palm Swim Shorts. There’s no more need to pack different clothes just for a day out:by all-day comfort, we mean from your morning surf to a midnight beach bonfire. Our Palm Swim Shorts are built with two convenient side pockets so you can keep everything close to you while you’re out and about. You won’t need to leave your headphones, music, smartphone, cash, coins, or anything behind if you don’t want to. If you’d like to safely store your essentials, our men’s designer swim shorts have a secure Velcro flap on the back pocket that will keep them where they need to be. And right at your fingertips for maximum convenience, too. Whatever you get up to on the beach—from splashing around with the kids to kicking around a soccer ball—you won’t have to think twice about anything falling out. Your Palm Swim Shorts have a stylish mid-length cut that’s a perfect mix of smart, casual, and classic. You’ll even find a hidden credit card pocket within the gently soft inside lining, which is the ideal secret place to keep your card. It’s super-quick to access if you spot something you’d like to buy without digging around for a wallet, like that ice-cold beer in the middle of a hot afternoon! Even better, the inner lining is made from a fine breathable mesh linen that sits softly against your skin, so can feel effortlessly comfortable all day long. 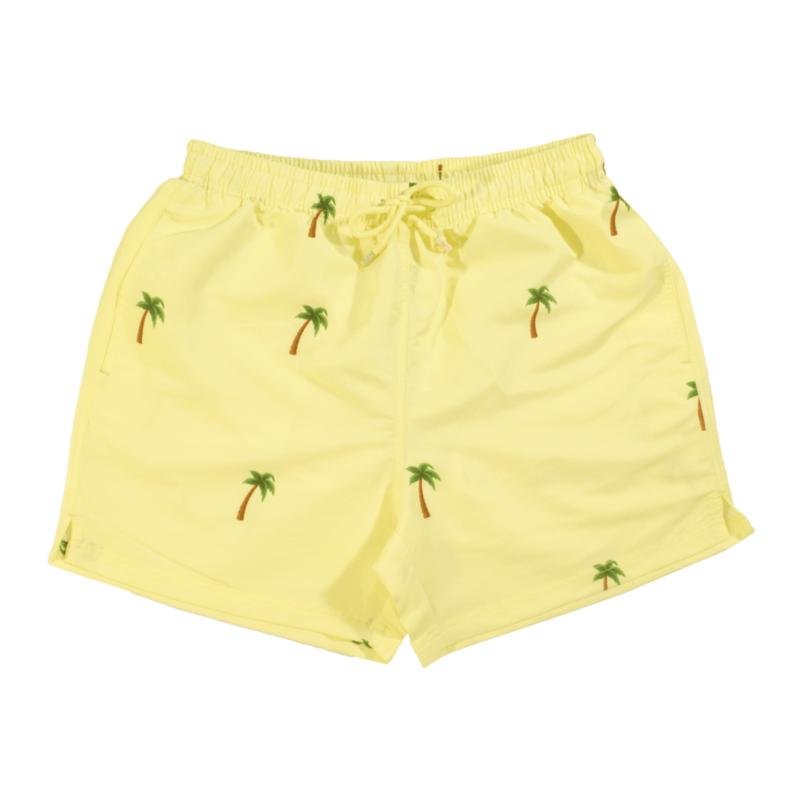 Palm Swim Shorts for the Summer Sun! The majestic palm stands tall through all desert heats. In the scorching desert heat, it’s a sign of endurance and strength, and we’ve taken our inspiration from this timeless symbol while designing our latest Palm Swim Shorts. In this case, from the palms of Abu Dhabi that are dotted everywhere from the city to the Middle Eastern desert sands. We’re all about the beautiful things in life when it comes to our designs, and it’s what the Decisive Lifestyle is all about. Taking the awesome things in life and bringing them to you in all our beachwear. Who can be bothered with complicated washing nonsense when having a good time? 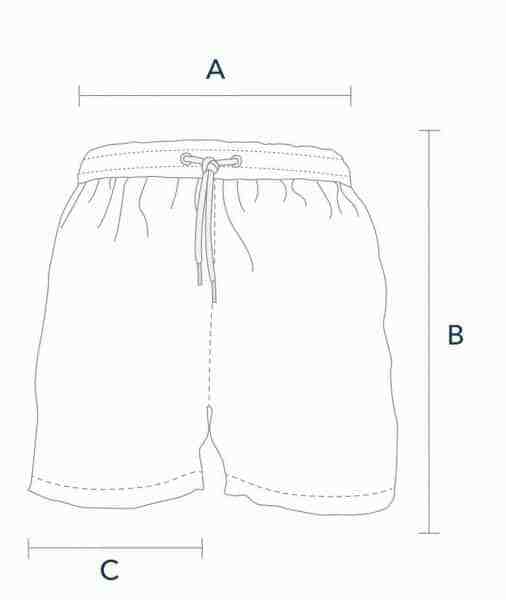 We don’t see the point, which is why our Palm Swim Shorts are made using easily machine washable fabric. Nobody wants to waste precious time doing different loads for different fabrics or turning things inside out because they aren’t colourfast. All our men’s designer swim shorts are printed with vivid, durable colours that will stay bright as the day you bought them for three years at least. Simply wash, wear, and get out there! 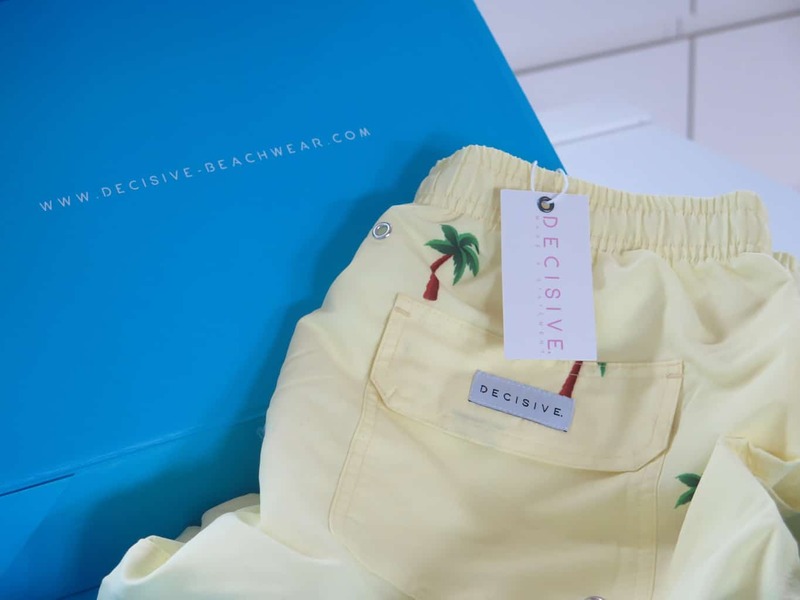 Decisive Beachwear will send you your swim shorts anywhere in the world with free shipping. We stock a diverse range of sizes, including small, medium, large, and extra-large. There’s something for every modern, stylish man, and even for kids too. With an adjustable waist and drawstring with metal stoppers, there’s a size for everybody. Plus, you’ll never have to fuss around trying to get the drawstrings out of the waist. Super convenient! The shorts are great, look good, fit good and are just amazing. The only negative thing I could say would be the metal piece on the two strings on the laces. They already fell off. Regarding the metal stopper this shouldn’t happened. We’ve reached out to you via email about a replacement.